Photo from the Wikimedia Commons. The Rainbow Flag, also known as the Pride Flag and Gay Pride Flag, is a symbol of LGBTQ pride. The colors reflect the diversity within the Lesbian, Gay, Bisexual, Transgender, and Queer community, and the flag is often used as a symbol of pride in LGBTQ rights marches and parades. 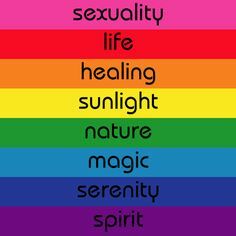 The Rainbow Flag was originally designed and hand dyed by San Francisco artist and drag queen Gilbert Baker in 1978. It first flew in the San Francisco Gay Freedom Day Parade on June 25, 1978. Since then, the design has undergone several revisions. As of 2018, the most common variant consists of six stripes, with the colors red, orange, yellow, green, blue, and violet. The hot pink and turquoise have been totally removed, and indigo has been replaced with blue. Personally, I find it ironic that the two colors that were removed represent sexuality, art, and magic, since I find those areas to be symbolically important and defining characteristics for many LGBT people. The flag is commonly flown horizontally, with the red stripe on top, as the colors would appear in a natural rainbow. Many variations of the rainbow flag have been used. Some of the more common ones include the Greek letter ‘lambda’ (lower case) in white in the middle of the flag and a pink triangle or black triangle in the upper left corner. Other colors have been added, such as a black stripe symbolizing those community members lost to AIDS. Other flags have been created to celebrate other types of Pride in the LGBT community such as Trans pride, Leather pride, and Bear pride. Last year there was controversy in Philadelphia because black and brown stripes were added to their rainbow flag as part of the city’s “More Color More Pride” campaign to increase the visibility of LGBT People of Color. The campaign was started in response to racial discrimination in Philadelphia gay bars. This created a great deal of controversy and even some backlash. 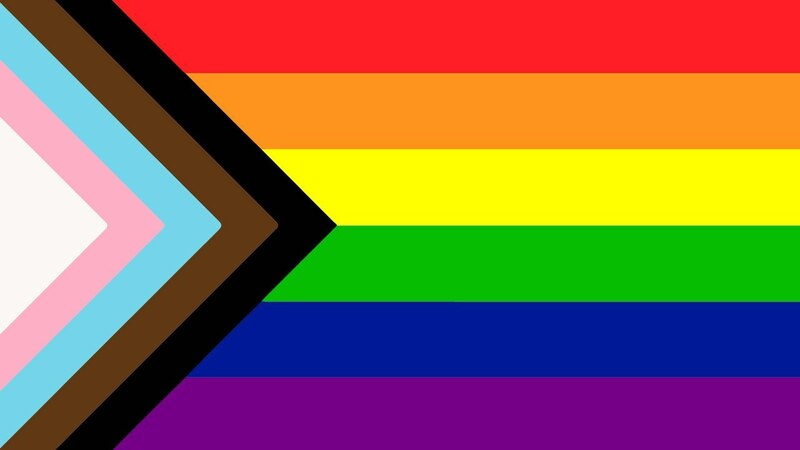 This year another rebooted Pride flag (https://www.kickstarter.com/projects/danielquasar/progress-a-pride-flag-reboot) has been introduced. The new design features the traditional six stripes, but has an added triangle or arrow on the left side featuring more colors. 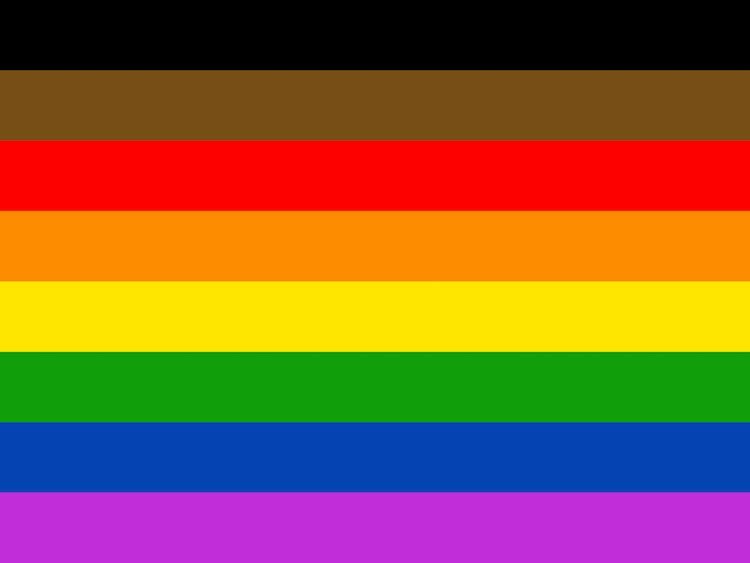 The added black and brown stripes represent both people of color and those who are living with or have died from AIDS. Light blue, light pink, and white stripes were added to represent trans individuals. The rainbow flag celebrates its 40th anniversary this year in 2018. During the Pride celebrations in June of 2003 during its 25th anniversary, Gilbert Baker restored the rainbow flag back to its original eight-striped version and has since advocated that others do the same. However, the eight-striped version has seen little adoption by the wider gay community, which has mostly stuck with the better known six-striped version. Baker passed away in 2017. Today many LGBT individuals and straight allies put rainbow flags in the front of their yards and/or front doors, or use rainbow bumper stickers on their vehicles to use as an outward symbol of their identity or support. 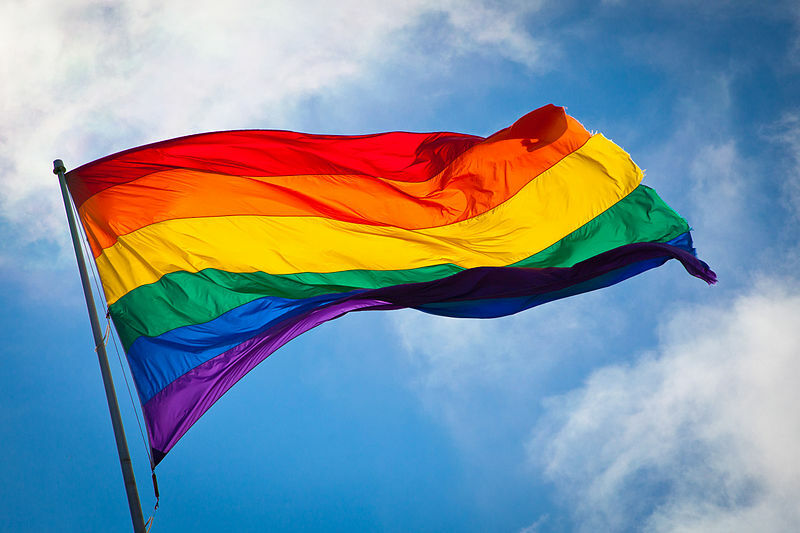 The rainbow flag, in an LGBTQ context, has also found wide application on all manner of products including jewelry, clothing and other personal items and the rainbow flag colors are routinely used as a show of LGBT identity and solidarity. As for the controversy over other flags, I advocate using whichever flag you like best or that best represents you and that you respect the right of others to do the same. I personally like the original eight stripe version, but I also see the merits of the newer flags aiming to be more inclusive. This entry was posted on June 25, 2018 by Mel Mystery. It was filed under LGBT History .